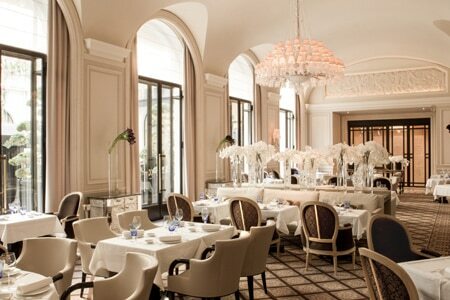 Le George, dedicated to Mediterranean fare, has opened its doors in the Four Seasons Hôtel George V Paris. Tuscany-native Marco Garfagnini, former chef of Il Lago in the Four Seasons Hotel des Bergues Geneva, helms its stoves. Le George, Four Seasons Hôtel George V Paris 31, av. George V, 75008 Paris, 01 49 52 70 00. From November 5-December 18, 2015, guests at Alain Ducasse au Plaza Athénée can enjoy two specially chosen Bordeaux wines. Frédéric Engerer, president of Château Latour, has selected Les Forts de Latour 2005 (45€ per glass, 135€ per carafe, 270€ per bottle) and Château Latour 1999 (125€ per glass, 375€ per carafe, 745€ per bottle). These wines are available during lunch (Thursdays and Fridays). For more information, visit Alain Ducasse's website. 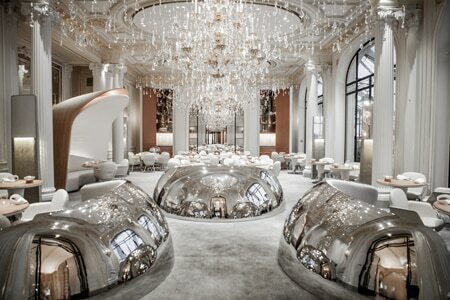 Alain Ducasse au Plaza Athénée, Hôtel Plaza Athénée 25, av. Montaigne, 75008 Paris, 01 53 67 65 00. Master chef Pierre Gagnaire has initiated a collaboration with Fouquet’s to oversee its menu. Dishes include marinated mackerel, fried whiting, Cognac-blazed beef fillet with pepper sauce and chocolate fondant. Fouquet's, Hôtel Fouquet's Barrière Paris 99, av. des Champs-Élysées, 75008 Paris, 01 40 69 60 50. Les Fables de la Fontaine, the famous seafood restaurant in the 7th arrondissement, has faced refurbishment. The modern décor has been rejuvenated with raw stone and wooden fixtures and a new chef helms the stoves, the twenty-odd-year-old Julia Sedefdjian. Among signature dishes, expect raw and baked haddock with crusty egg yolk and seaweed vinaigrette and a lobster hot dog. Les Fables de la Fontaine, 131, rue Saint Dominique, Paris 75007, 01 44 18 37 55. Roseval has closed. Roseval, 1 Rue d'Eupatoria, Paris, France 75020, no phone.